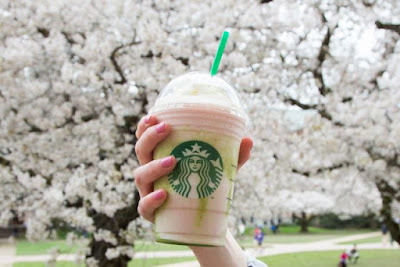 Inspired by the Japanese tradition of watching cherry blossoms bloom this time of year, Starbucks offers the new, very-limited-time Cherry Blossom Frappuccino here in the U.S. but it's only around until this Sunday. The drink features strawberries and white chocolate sauce blended with ice, milk, and a matcha (green tea) drizzle, topped with whipped cream and a sprinkle of matcha. The Cherry Blossom Frappuccino can be found at participating U.S. locations through Sunday, March 20, 2016, which is the first day of spring. Sakura (cherry blossom)-themed beverages have enjoyed a Pumpkin Spice Latte-like popularity over in Japan since 2010, when they were first introduced (there's even cherry blossom merchandise and cherry blossom cake). This year they got a Sakura Blossom & Strawberry Latte and Sakura Blossom & Strawberry Creme Frappuccino. The introduction of the Cherry Blossom Frappuccino marks the first time that we've gotten a similar drink here in the U.S. (albeit for a much shorter duration and without any cherry blossom flavor actually involved).